Catherine the Great assumed power in 1762 after a coup d' etat, which she engineered together with the officers of the Royal Guard. Unlike her husband, she was well loved by the country's elite and received a very good press in Europe thanks to her contacts with various figures of the French Enlightenment. Catherine enjoyed an extremely luxurious and decadent court life and was the first monarch to move into the newly built Winter Palace. Catherine started a royal art collection which later developed into the world-famous Hermitage which required the construction of several additional buildings (the Small Hermitage and the Old Hermitage) along the Neva embankment to house the growing number of exhibits. Catherine commissioned the building of the Hermitage Theater and ensured the area surrounding the palace was adorned with the finest houses and the only the most elegant architecture. The embankments of the River Neva were reworked in elegant red granite and the Summer Gardens were adorned with an intricate wrought iron fence, designed by the craftsman Yuri Felten and created between 1773 and 1786. Under Catherine's patronage science, the arts and trade all flourished. New buildings for the Russian Academy of Sciences, the Academy of Fine Arts and the first Public Library (now the Russian National Library) were constructed and the large Gostiny Dvor trading complex was opened on Nevsky Prospect. Many educational institutions were also established. In Tsarskoye Selo (now Pushkin) several additions were made to the royal palace, including a new wing, the Cameron Gallery, which served as living quarters for Catherine the Great herself. The delightful park surrouding the palaces was littered with pavilions and architectural follies and gives some indication of the lively social life Catherine and her closet confidantes enjoyed. Among Catherine's many reforms was the reform of the St. Petersburg local administration. In 1766 the position of gorodskoi golova (a mayor) was established, in 1774 a Magistrat (municipal council) was formed and 12 years later it was transformed into the city Duma. 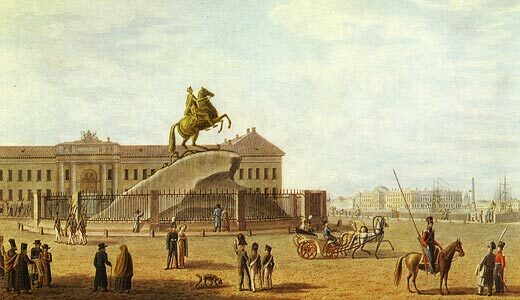 In 1873 a monument to Catherine the Great was built in a small garden just off Nevsky Prospect (between the Public Library and the Alexandrinsky Theater). Thousands of people come to visit the tomb of the city's greatest and most progressive monarch every year in the Peter and Paul Cathedral.